Book Now Bookings are required for this property. 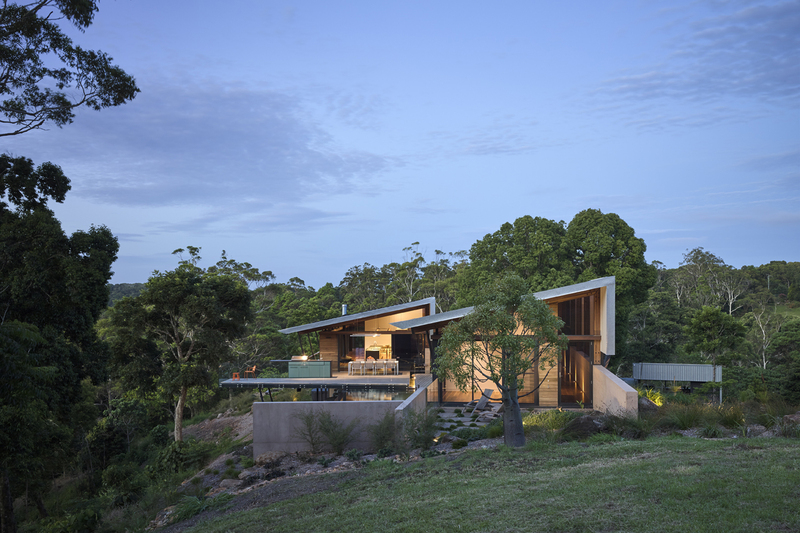 The Ridge House is situated on the western edge of a 25 acre property on the Blackall Range near Montville. At the end of winding entry drive past spring-fed ponds, over creeks flanked by rainforest and rolling hills of manicured lawns, the house emerges from its surrounds. A north / south ridge line with commanding views over the property to the north and east and Baroon Pocket Dam to the west. The complimentary use of rammed earth, galvanised steel and glass along with the extensive use of timber provides a rich palette of materials and surfaces. Two carefully composed pavilions are arranged to provide a variety of outdoor spaces and an ascending entry between them. The simple move of skewing the two pavilions and careful consideration in the micro planning of the building relative to site constraints and opportunities, allows for a diverse range of experiences and views within the individual rooms. The space created between the two pavilions becomes the primary outdoor room and also facilitates circulation between the pavilions, pool and decks. It is a celebration of the building’s context and views and experienced as the summit of the entry sequence through the property and into the house. Bookings open on Wednesday 10 October at 9am. To secure your booking visit this building page, click on the "BOOK NOW" button and follow the prompts through the Eventbrite website. To ensure a fair allocation there will be a limited ticket allocation per person. Bookings will be taken on a first come, first served basis. Pre-booked tours will book out quickly. There will be no waitlists, so if you miss out, please check back in case others cancel. Pre-booked guided tours with the architect at 10am, 10.45am, 11.30am, 12.15pm, 1pm.